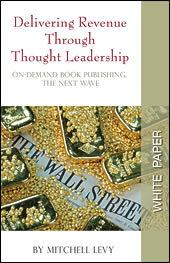 Books can quickly and easily create thought leadership for the author and their company. A single book is great, a book series is even better. The following two assets discuss the effects that books have had on the businesses that create, promote and distribute them: 1) Quick2Publish's white paper and 2) RainToday's research study. WHERE should you distribute it? HOW do you make sure that the book is successful? WHY wait to write your book? Find out how publishing a business book impacted 200 authors' ability to generate new leads, close deals, charge higher fees, differentiate themselves from competitors, improve their brand, and more. Click here for more info and to purchase the study. If you'd like to discuss how Quick2Publish (Happy About®'s parent company) can help you create a book or book series, please don't hesitate to contact us. With our pool of 137 ghost writers, we can help you write on a plethora of topics. "It is one of those concepts that is both simple and elegant - it gives you credibility because you are taking the exact message from your clients - not just the customer quote, but the overall value proposition, the "pain" and the solution - from the client perspective - and sharing that story with a new audience. I would recommend this tool to anyone who believes that they should have a greater client base out there." "It's a gift. It's a guide. It's a chance to tell the whole story in a way that white papers only hope to achieve. It can take the time to tell the story instead of the bullet points and it's a tchotchke that people will not throw out - a book has intrinsic value." "We needed to quickly produce an asset that would enable us to speak to business executives, and walk into corporations at the top level. Quick2Publish delivered just that, in a big way! We now have a new and effective tool to educate and communicate our message to a whole new set of audience." "We knew that our company had built the 'better mousetrap' but we were having trouble getting industry recognition. Our marketing material was undistinguished. Then we became published authors - the Book "Happy About Apartment Management" established our company as an industry authority and instantly distinguished our collateral marketing material. This book has been a powerful tool that we have used over and over to open doors." Bob Klag, CEO, Westlake Realty Group, Inc.